Scraps of Whisper White Thick, Gorgeous Grape and Coastal Cabana. Adhere a piece of the Whisper White Thick Cardstock and the larger piece of DSP with mono liquid glue. 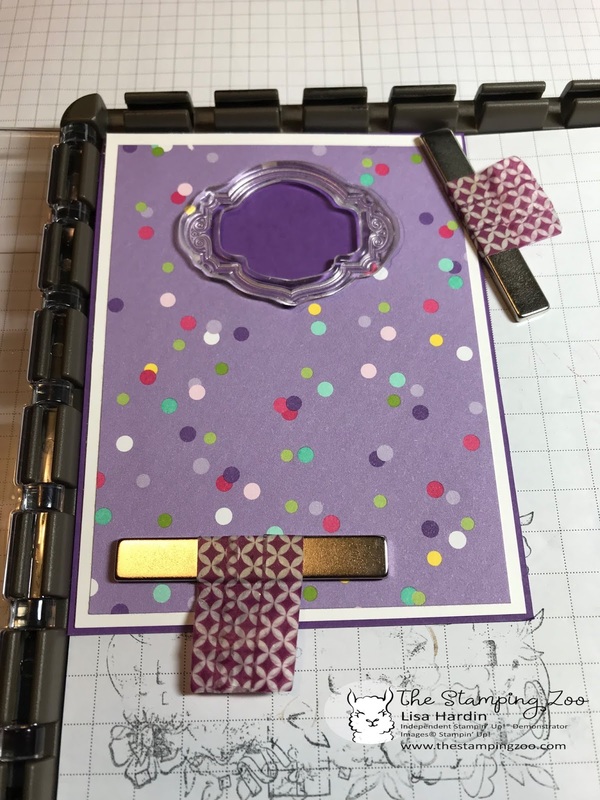 Cut a window using the label die in the upper 1/3 of the card front. 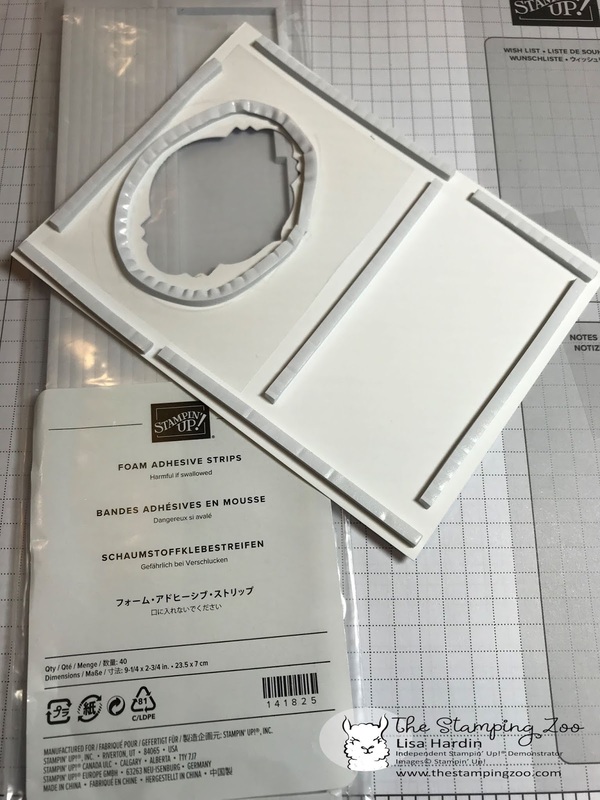 Place the folded card base into the corner of the Stamparatus. Then lay the card front with the die cut window in it, place it over the card base so that it is centered. Once centered, place the label stamp directly into the die cut. Then lower the Stamparatus plate so the stamp attaches, lift it up and remove the card front, then ink and stamp the label stamp. Do the same with the "Happy Birthday" stamp. 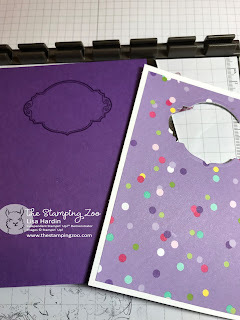 By doing this, your stamps will line up perfectly with the shaker window! 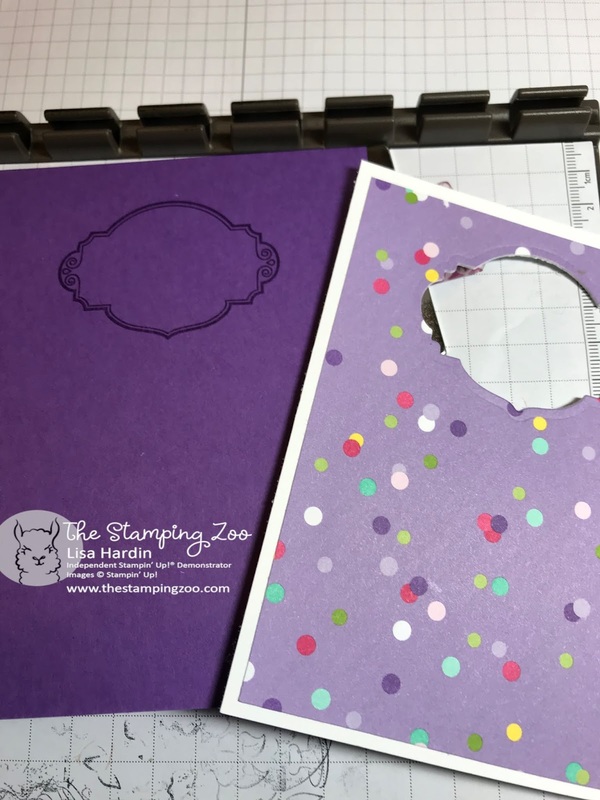 Turn the card front over and on the backside, adhere a piece of window sheet over the label die cut hole. I find that using the mono liquid gives a nice flat window for the shaker part of the card. Then, attach adhesive foam strips around the window and on the rest of the card. Remember to make a complete circle around the die cut window so that your sequins don't fall out. 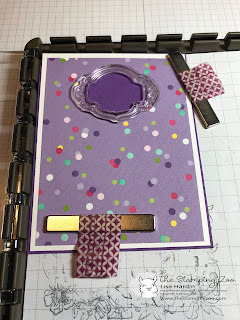 Place your sequins on the stamped area of the card base, remove backing from all pieces of the foam strips, and carefully adhere the card front to the card base. I used leftover sequins from a Paper Pumpkin kit (don't forget those PP extras!) but you could easily substitute with the Iridescent Sequins. 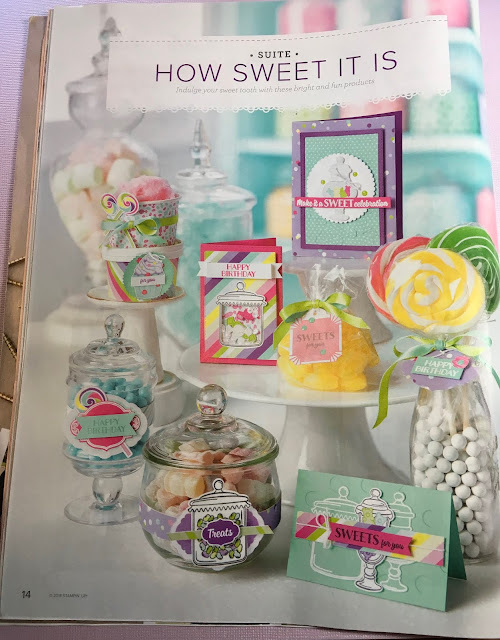 On your piece of colored scrap cardstock, stamp two different apothecary jars in versamark, and then heat emboss with white embossing powder. Die cut and set aside. On the white scrap, stamp the final apothecary jar in colored ink (I used the ink that matched the card base), and your choice of candies. Color the candies if you choose. Adhere the two embossed die cuts onto the front of the card with snail, and pop the final jar die cut up on dimensionals. Finally, use some of the beautiful, color coordinated glitter enamel dots. 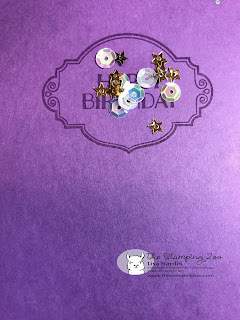 For the inside of the card, stamp a sentiment on the second piece of Whisper White Thick cardstock. In my cards I stamped the sentiment in full strength ink, then I stamped the lollipop in 2nd generation ink. Finally, adhere the strip of DSP to either the bottom or top of the white cardstock, adhere to the inside of the card, and give to a happy recipient. 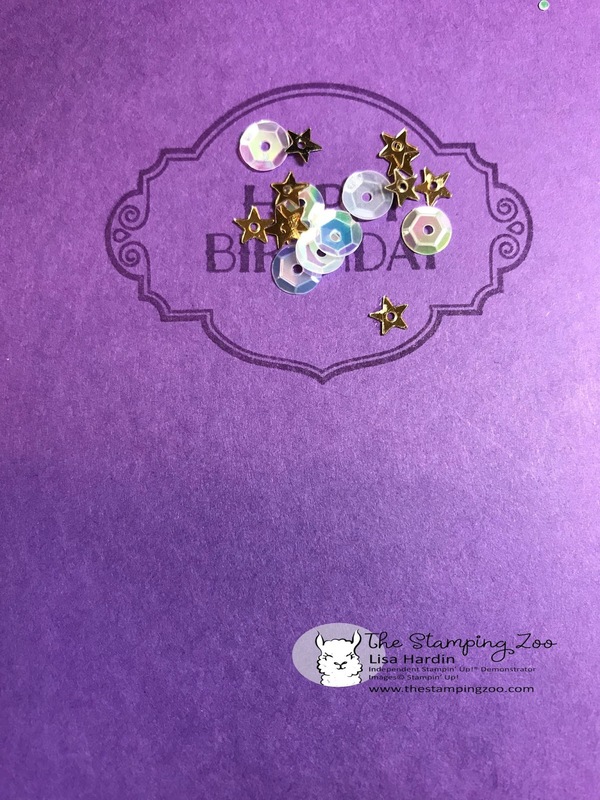 Thank you so much for visiting The Stamping Zoo! 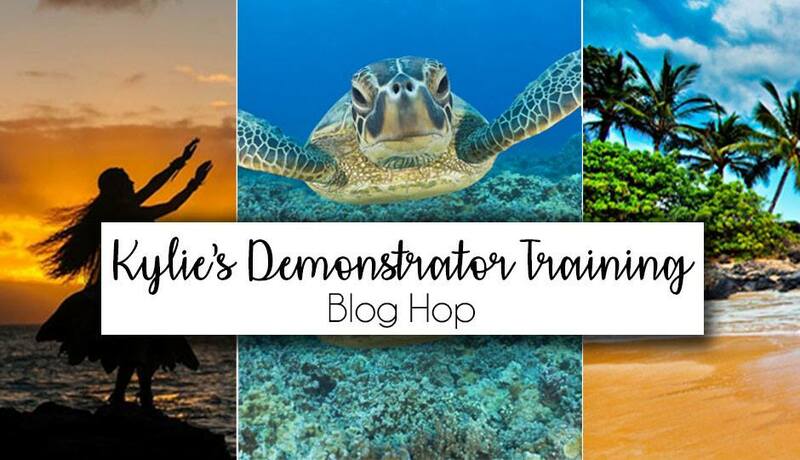 Please stop by soon, and contact me with any questions.